So on March 31st of 2018, MACCA said "u should make an easter mod that fucks the game up". Since it's kind of hard to make a mod distributed in LMLM format do that, I took a different approach. 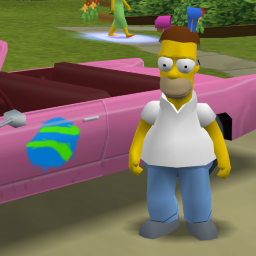 This mod adds a piece of head-wear for Homer, adds a decal to his car, and enhances S-M-R-T to be reprehensibly festive. So put on your necktie-barbecue-skewer-coconut rabbit ears and enjoy. BY DOWNLOADING THIS MOD YOU AGREE NOT TO HOLD THE MOD CREATOR RESPONSIBLE IF YOU ARE DISOWNED, KILLED, MAIMED, OR DEVELOP MESOTHELIOMA AS A RESULT OF PLAYING THIS MOD. xUnknown You... actually made a mod? You... actually made a mod?